The kitchen now overlooks the dining room, which in turn opens to a terrace via large lift-and-slide glass doors, making both interior spaces feel larger. “I like to blur the line between interior and exterior space where appropriate,” Coleman says. The pivoting floor-to-ceiling windows at opposite ends of the kitchen also accomplish this. The large single panes ensure that there is no visual interruption between inside and outside. By pivoting out from the bottom and in from the top, the windows allow air to circulate without letting in rain, making them particularly appropriate for Seattle’s climate. The change in floor level ― the kitchen is two steps above the dining room ― is key to how the space functions. “The sight lines are such that when seated at the dining table, you aren’t looking right into the dirty dishes,” Coleman explains. The elevation also gives the homeowner an enviable vantage point from the range. Frosted glass for windows that face the neighboring house maximize daylight while preserving privacy. Clear glass is used for higher panes. 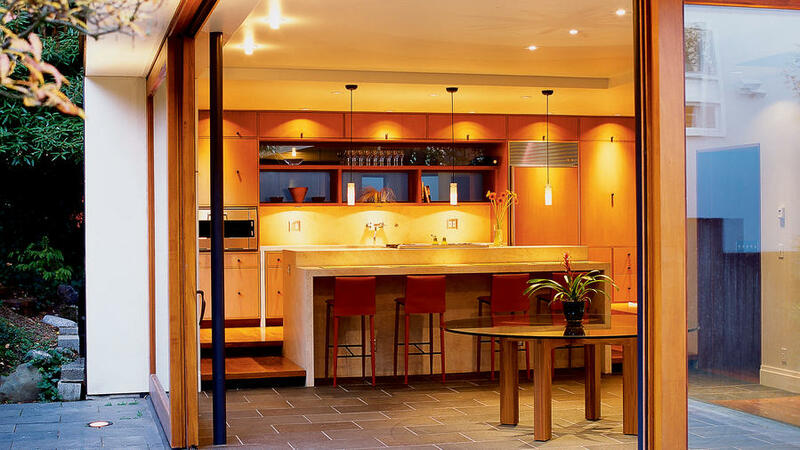 Coordinating colors and materials create a balanced look: The floors are quarter-sawn, face-nailed oak tinted to complement the mahogany cabinet fronts and window and door frames. The simple, extendable Tara faucet from Dornbracht (800/774-1181 for distributors) maintains the clean look of the kitchen. It can lengthen to reach the far corners of the sink. To create a feeling of solidness and grandeur, the French limestone countertops sit on stone side panels rather than on wood. Underneath, the wood cabinets act as paneling.